eapb is a leading digital agency based in Sussex. The company has a reputation for creating creative, innovative and holistic digital marketing campaigns that deliver measurable results and significant return on investment for its clients. Services offered include search engine optimisation (SEO), mobile marketing, paid search, e-commerce, social media and apps for business. 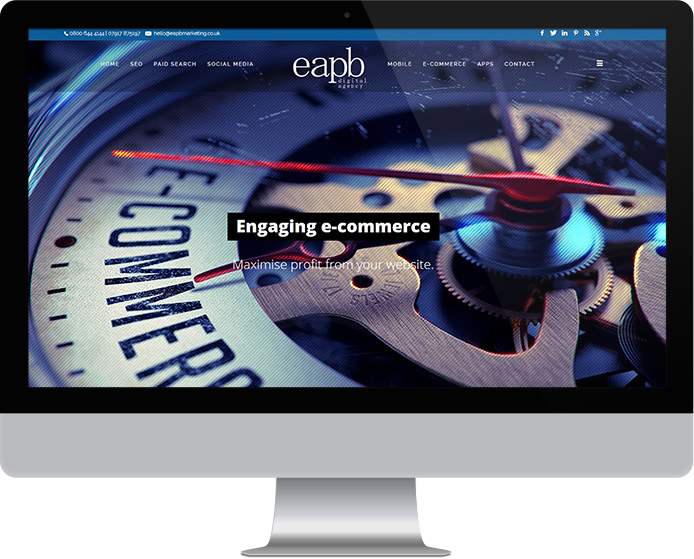 Our brief was to re-build and re-theme eapb’s existing website to give it a fresh new look and feel that would make it stand out from the crowd in an increasingly competitive marketplace. Digital marketing is a crowded arena, so it was vital that the new website would give eapb a distinctive visual identity, while attracting traffic from Google and allowing potential clients to quickly find the information they were looking for. To achieve this, we worked alongside the client to completely re-brand the website with a fresh, vibrant and professional feel. We upgraded the website to the latest available page builder and used modern animation to support the fresh new look and feel. eapb already had high-quality content available on its website, but we worked with the client to make adjustments that would allow it to perform better within the new design. For example, the home page contained content blocks and sliders to pull users into the rest of the content on the site. The resulting website has delivered the new look and feel that eapb wanted, and is proving to be very effective in capturing web traffic and converting it to enquiries.